Stock screener has 1000+ filtering criteria to find the right stocks with one click. 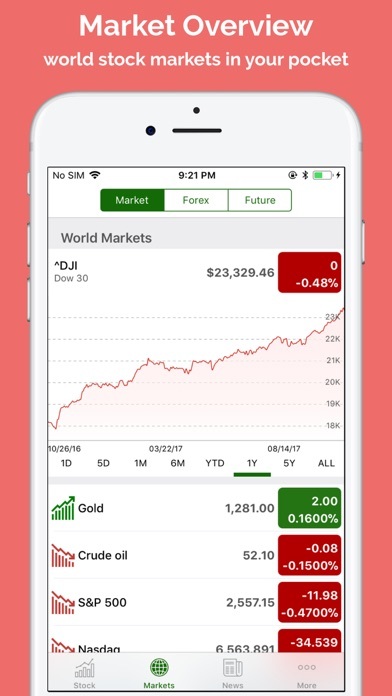 This #1 stock filter app can screen stocks by the stock prices, stock volumes, stock market cap, stock sectors, OTC & Penny stocks, and many of their stock technical and fundamental parameters. 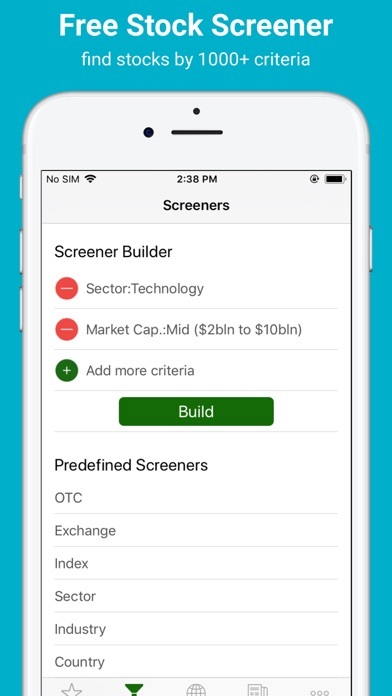 The main feature includes: SCREENING STOCKS: Stock Screener Builder allows you to find potential stocks to invest by adding as many criteria as you want. Ex: Find all the stocks on NASDAQ with Sector: Technology and Market Cap >200bln. With one or two clicks you can find the right stock to invest: - By stock sector: Technology, Energy, Healthcare, Finance, etc. - By stocks price: Penny, $1-$10, $50-$100, etc - By stock market cap: big cap, micro cap, etc - By many other stocks fundamental & technical parameters ADVANCED STOCK CHARTS: A full-screen high-resolution stock chart with hundreds of technical indicators, moving averages, price bands, Fibonacci retracement lines, overlay settings, compare performance, chart type, & date range. All charts are customized with your desired technical indicator parameters. - Chart types: Candle Stick, Bar, Line. 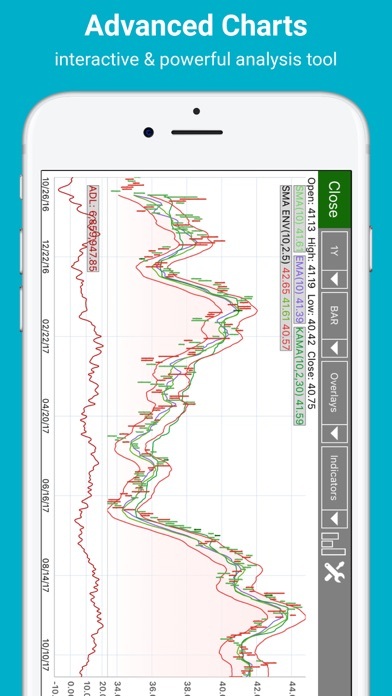 - Overlays: SMA, EMA, KAMA, Bollinger Bands, etc. 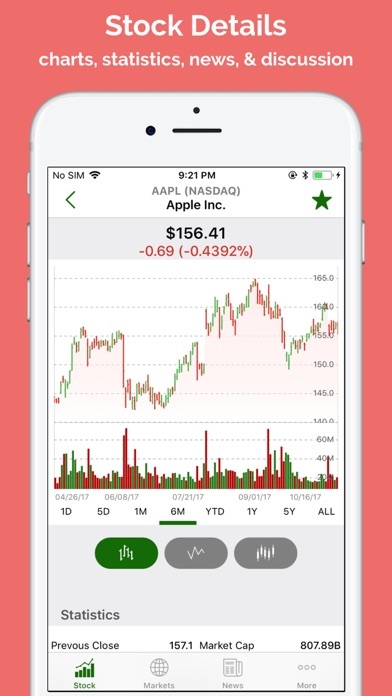 - Indicators: ADL, ADX, Aroon, ATR, CCI, CMF, etc - Interactive drawing tools The 1# STOCK ALERT - Price limit alerts Ex: Notify me when AAPL price > $200 - Price recurring alerts Ex: Notify me FB price every 30min STOCK MARKET OVERVIEW: - Stock indexes of more than 20 countries - United States: Dow Jones, NYSE, NASDAQ, OTC & Penny Stocks, S&P 500 & AMEX - Australia: ASX 200, ASX 50 & NZX 50 - United Kingdom: FTSE 100, FTSE All - Canada: Toronto TSX - India: SENSEX, NSE, BSE - Europe: Euronext, DAX - Japan: Tokyo Stock Exchange & Nikkei Indices - Asia: Shanghai, Shenzhen, HKSE, MYX, SGX, IDX, KOSDAQ, etc. - Bond markets: US, UK, Australia and many others - Forex: BTCUSD, EURUSD, USDJPY, etc - Futures and Commodities: Gold, Oil, Natural Gas STOCK DISCUSSIONS & STOCK NEWS: - Stocks News: breaking news from any stock - Stock Discussion: US Stock market only Stock Screener currently supports the following stock exchanges: - United States: Dow Jones, NYSE, NASDAQ, OTC, S&P 500 & AMEX - Australia: ASX 200, ASX 50 & NZX 50 - United Kingdom: FTSE 100, FTSE All - Canada: Toronto TSX, TSXV - India: SENSEX, NSE, BSE - Argentina: Buenos Aires Stock Exchange (BYMA) - Austria: Vienna Stock Exchange - Belgium: Euronext Brussels - Brazil: Sao Paolo Stock Exchange (BOVESPA) - Chile: Santiago Stock Exchange - China: Shanghai & Shenzhen Stock Exchange - Czech Republic: Prague Stock Exchange Index - Denmark: Nasdaq OMX Copenhagen - Egypt: Egyptian Exchange Index (EGID) - Estonia: Nasdaq OMX Tallinn - Finland: Nasdaq OMX Helsinki - France: Euronext, Euronext Paris - Germany: Berlin, Bremen, Dusseldorf, Frankfurt, Hamburg, Hanover, Munich, Stuttgart Stock Exchanges & Deutsche Boerse XETRA - Greece: Athens Stock Exchange (ATHEX) - Hong Kong: Hong Kong Stock Exchange (HKEX) - Iceland: Nasdaq OMX Iceland - Indonesia: Indonesia Stock Exchange (IDX) - Ireland: Irish Stock Exchange - Israel: Tel Aviv Stock Exchange - Italy: EuroTLX & Italian Stock Exchange - Japan: Nikkei Indices & Tokyo Stock Exchange - Malaysia: Malaysian Stock Exchange - Mexico: Mexico Stock Exchange (BMV) - Netherlands: Euronext Amsterdam - New Zealand Stock Exchange (NZX) - Norway: Oslo Stock Exchange - Portugal: Euronext Lisbon - Qatar Stock Exchange - Russia: Moscow Exchange (MOEX) - Singapore Stock Exchange (SGX) - Korea Stock Exchange & KOSDAQ - Spain: Barcelona & Madrid Stock Exchange - Sweden: Nasdaq OMX Stockholm - Switzerland: Swiss Exchange (SIX) - Thailand: Stock Exchange of Thailand (SET) - Turkey: Borsa Istanbul And 10 more stock exchanges Disclaimer: Stock Screener is only a useful tool to find & track stocks. This app is not responsible for profits, revenues, or data and financial losses. 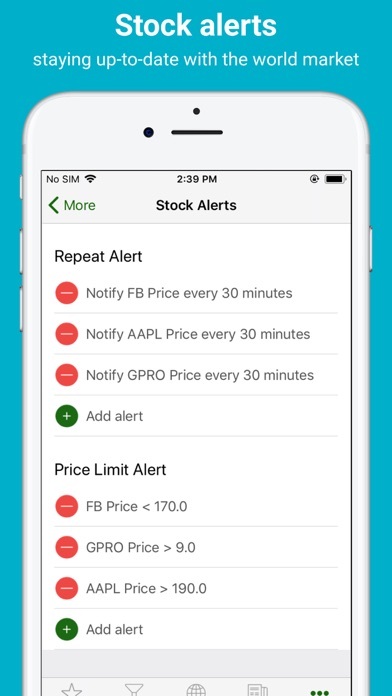 The main reason I bought this app was for the stock alerts but they do not work at all – which makes it pretty much USELESS. What’s worse, multiple attempts to contact the developer have gone unanswered. Save your money. I have no use for apps that are so self interested in the US. There’s a whole world out there hillbillies! Omg this is money in my bank✈️ hello good life!!!! As advertised. I did upgrade for the pro. I only purchased this for screening & it does just that. Thought the screener was pretty good so I went ahead and paid for premium. Found out the ALERTS never work. Literally have put in at least 50 alerts in the last day and haven’t received a single one. That makes this useless garbage. I just love having this Ap available. I use it often for my Watch List. I like this app a lot, and I’m considering paying for premium, but I want to know if the premium version will let me ave my screeners. That is the feature this is most lacking. I have several favorite lengthy screens that I use. I cannot find a way to save them to avoid having to enter them each time I want to use them.